This year's parliamentary election in Latvia seems to be underestimated by Latvians themselves who have adopted a true stoical attitude according to which "what happens - happens". No wonder they don't trust politicians anymore - Latvia is in a deep political crisis, and citizens put the blame mostly on - surprise surprise - the parliament deputies. However, whether we realize it or not, this election is going to be historical. It is quite possible that for the first time Latvia will be ruled by non-Latvians. The current parliament (9. Saeima) has the lowest public support ever. The slogan "Atlaist Saeimu!" (Dismiss the parliament!) has virtually dominated the political discourse in Latvia over the last months. It is clear that the Saeima has nothing left to say and is only waiting for the next election. It was even criticized by the President Valdis Zatlers for the lack of a coherent policy, public trust and a clear vision of the political future of Latvia. Latvians blame the deputies for the horrid situation in the country - and sometimes give vent to their emotions by throwing stones at the windows of the parliament. According to them, deputies are lazy, interested only in their own financial gains – even when the country faces a crisis – and have too close relations with suspiciously rich businessmen. There is a clear straight line between “average” Latvians and the caste of politicians and businessmen. Some even speak of the “party dictatorship” since parties exchange members no matter their political beliefs, so that a closed environment of ever the same politicians rules the country and allows for no fresh blood and no changes. The source of dissatisfaction for Latvians is mainly unemployment (now 15.6%, 17.1% in February), low salaries and pensions, limited health and social care, extensive individual as well as national debt. Parties are aware of the Latvians’ skepticism and focus on the goal of overcoming the 5-per cent threshold (necessary to get into the parliament) instead of trying to work out comprehensive programs. In order to do it, they form associations – together with parties which are sometimes very distant in the sense of political stance. This way they protect politicians who seem to have become “professional deputies” over the years. 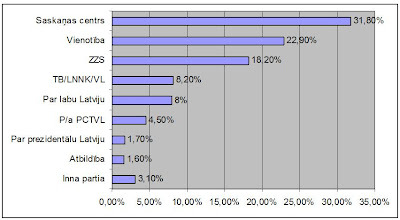 When asked about the possible election results, Latvian name mostly two winners: Saskaņas centrs and Vienotība. The fight for power will take place between these two associations. It is possible that they will receive similar number of votes and the small parties will have even more to say. Even if it gets only 18.20% votes in the surveys, the true winner will probably be ZZS (party of the “green” and farmers) – because it will be asked by the two big parties to form a coalition. In this situation ZZS may demand anything – possibly even the post of Prime Minister. This will be a hard bargain for Vienotība, because keeping Dombrovskis – the current Prime Minister – in his position is one of the objectives of its program. 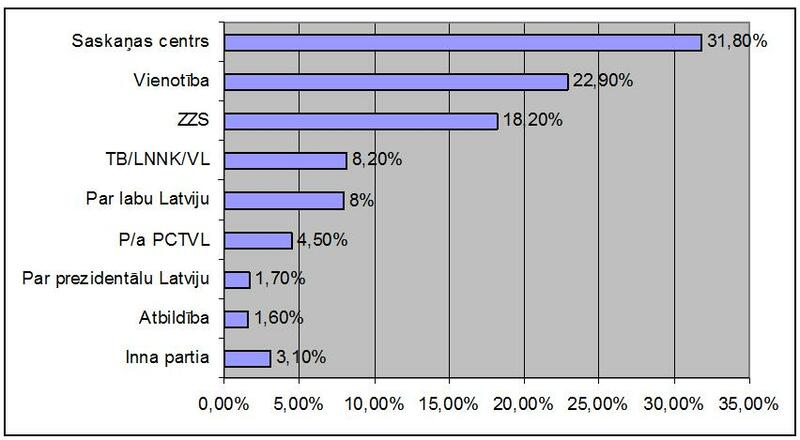 Moreover, Saskaņas centrs will be probably backed up by Par labu Latviju (PLL) with its 8%. As a result, Latvia may end up with a pro-minority parliament – as predicted at the beginning of this note. Paradoxically, the hope for Vienotība lies with… radical pro-Russian and radical nationalistic associations – PCTVL and TB/LNNK/Visu Latvijai respectively. The more votes they get, the less seats will go to SC. On the other hand, it is hardly possible for them to enter any coalition, which would make the parliament rather “patchy”. Always when citizens are not satisfied with what is happening in their country they blame the ruling power for the situation. It makes it easy to predict that the opponent of this ruling power may win in the next election. This is exactly what is going on in Latvia. It is a small country with a complex of a young and tiny democracy. That is why it has always chosen parties with nationalistic, right-wing inclinations – parties that made use of the pride of a small nation. However, right now it is facing the worst political and economic crisis after regaining independence. The crisis may force Latvians to give up some of their pride for the sake of financial stability. Of course, no one says that the SC alone know the magical cure to all the problems of Latvia. But they have one advantage over some of their opponents – they can say: “hey, it’s not our fault, we were in opposition when all this was happening”. And this may be enough. What will happen if SC wins? Latvian parliament is divided into supporters of a more nationalistic Latvia and supporters of “integration” (which is not a homogeneous concept but rather a scale). Up till now the former were the majority, and basically did what they wanted without paying much attention to the latter. Supporters of integration (or pro-minority parties) were very active in submitting draft laws that could not be accepted by the ruling power, but blocked the work of the parliament because they had to be discussed in a responsible committee and handed in for the first reading in the Saeima. These draft laws addressed such issues as giving non-citizens unconditioned citizenship, making Russian the state language, introducing Russian holidays into the Latvian calendar etc. Now, if the roles are to be switched, right-wing parties will become the meddlesome minority submitting draft laws that no one will accept and thus the work of the parliament will continue to be defective. SC may try to use the given time for improving the situation of ethnic minorities. They may do so at the cost of postponing necessary economic reforms – because they know that their power may last for a rather short time. (It is possible that Latvians will soon become impatient with lack of improvement and demand dismissing the parliament – which may be easier than it is now since giving the nation the possibility to dismiss the parliament is be one of the burning issues that 10. Saeima will have to deal with.) However, this scenario is not very probable since ZZS will block radical changes in the ethnic minority policy. It’s more probable that SC will start with economic reforms. These will not win them public trust because the situation in Latvia is so bad that it’s impossible to improve it during one parliament tenure. SC will run short of support before ever starting to handle the ethnic minority issue.